Late last week, Parlophone announced it would be releasing a new David Bowie box set titled Who Can I Be Now? (1974-1976), which featured the unreleased album The Gouster. 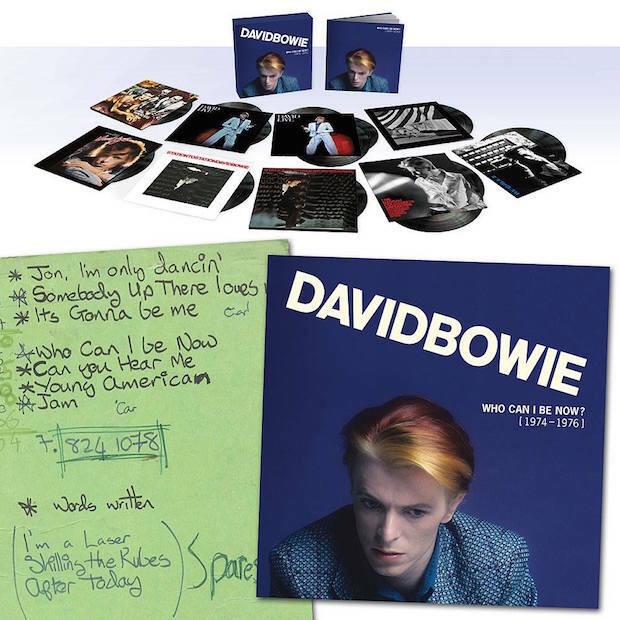 Now, the full details of the box set have been revealed via David Bowie’s official website. The box will contain The Gouster, along with studio albums Diamond Dogs, Young Americans and Station to Station, as well as the live albums David Live and Live Nassau Coliseum ’76. The set also features the compilation Re:Call 2, which features non-album tracks, single versions and b-sides. Who Can I Be Now? (1974-1976) will be released in digital format, as well as a 12-CD or 13-LP set. It’ll feature a hardback book with photos from Eric Stephen Jacobs, Tom Kelley, backup singer Geoff MacCormack, Terry O’Neill, Steve Schapiro, and more, in addition to liner notes written by Bowie’s collaborators Tony Visconti and Harry Maslin. Take a look at the contents unboxed above. Bowie’s last album was Blackstar. Read our Celebrate the Catalog feature on David Bowie’s complete discography.